dvd next copy oceans xstream | DVD next COPY Inc.
We continue to see more media becoming available via streaming services and video on demand sites like Netflix, YouTube and iTunes. These latest streaming media services on the internet are nice, however most of the time you cannot save or record what you are watching or listening to. Wouldn’t it be great to be able to record these streaming movies and audio? That is exactly what DVD neXt COPY Oceans XStream 2019 is built to do. DVD neXt COPY Oceans XStream 2019 records videos and audio from online video stores and other internet sources while they’re playing and saves them in superior digital quality as private-use-only backup copies. DVD neXt COPY Oceans XStream 2019 also has a built in converter that allows you to view or listen to your streaming media on portable playback devices as well as built in media player. So if you want to make backup copies all your streaming movies and audio then DVD neXt COPY Oceans XStream 2019 is the solution for you. $40.00 SPECIAL SALE DISCOUNT OFFER! Purchase and save $40.00 off the price of DVD neXt COPY Oceans XStream 2019. $56.00 SPECIAL SALE DISCOUNT OFFER! For current customers only! If you own any of our products you are entitled to a $56.00 off the price of DVD neXt COPY Oceans XStream 2019. Streaming video: Record streaming video from all the popular media websites! Click the screenshot below to see a larger image. Find out about all the new features and improvements and get the new software with a huge discount today! With the new Oceans XStream 2019, we are offering even more. Oceans XStream 2019 is now much quicker, An ultra fast all-purpose search function! Brand new: Oceans XStream 2019 Home which you can use as your new command center. Here you will find useful convenience functions and our smart new search function. Oceans XStream 2019 – Movies, Series, Videos, Music, Podcasts & Radio Stations: Record, Download, Convert and Enjoy Them Anywhere. And there’s a lot more! + All Streaming Services Netflix, Amazon, Hulu, YouTube, Ustream, CNN, BBC and a great deal of other internet streams can be recorded. 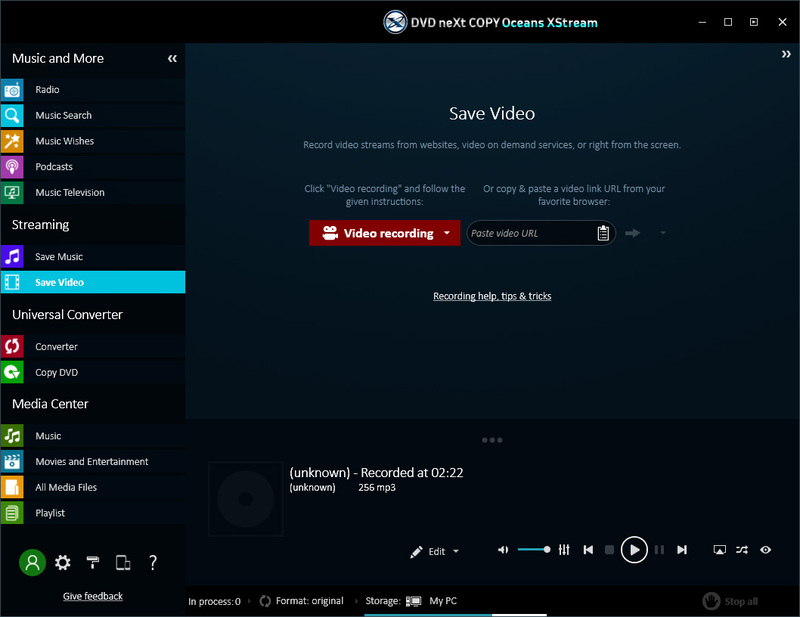 + Non-Stop Recording Oceans XStream 2019 can automatically record numerous films as well as series one episode after the other. While you’re sleeping, Oceans XStream 2019 does the work and can provide you with an entire series overnight. + Top Quality in the Right Format Oceans XStream 2019 is the only software to be optimized for adaptive streaming and the latest DRM mechanisms. This means that all your recordings will be saved in top quality HD and as an MP4, HVEC, H.264 or WMV. + Perfect Collection Oceans XStream 2019 gives your recordings the correct names and finds the movie description and tags, and then saves them all with the movies and series recordings. + The Best Live TV Streams 100 international live TV streams as well as dozens of the best music channels are available in a well-arranged fashion on Oceans XStream 2019. + Watch Now. Record for Later. Oceans XStream 2019 allows you to watch any television channel you want either by using the player on the side or in full-screen mode and enables you to record what you’re watching in a simple click. So get the new Oceans XStream 2019 software now! It’s my Music Oceans XStream 2019 saves music from Spotify, YouTube, Amazon Music, Deezer, Soundcloud, Apple Music and all other legal streaming sources. All it takes is one click to gain your MP3 files free of charge and in top quality for your music library. For Windows, Android and iOS. Oceans XStream 2019 Records Everything You Hear Online! + From Legal Sources Record music from Spotify, Deezer and other streaming services, download it from YouTube, Soundcloud and other portals, or record it as a private copy of internet radio streams. + Save in Top Quality Save any track in top quality as an MP3, AAC or WMA in up to 320 kBit/s. Lyrics and tags are automatically added too. + Unbeatably Fast No software saves music as quickly as Oceans XStream! It takes a few seconds to save 10 hits directly from YouTube and it records Spotify at 10 times the speed! + Discover Massive Variety Oceans XStream shows you all the music in the world. Hits, the latest charts, albums, discographies, 120 genres and up to 20,000,000 MP3s all at your disposal. + Find & Load Music For each music you are looking for, Oceans XStream lists all available versions of all streaming services. Click to hear them or save them to your music library. + Turning Dreams into Reality You have a wish. Oceans XStream 2019 will find the music! In top quality! Faster and better than anywhere else! Simply select the hits, albums or entire discographies of your favourite artist that you wish to have and Oceans XStream 2019 will find and save it all for you in the background. + Music According to Your Style Name a few example musicians or radios, and a “style” is created. Oceans XStream finds the new music for each of your styles! + Your Music Bot Do you want an automatic music collection for your style? 1,000 or more pieces of music? No problem. + Maximum Variety Includes a massive variety of more than 100,000 online radio stations ranging across 120 genres of music from any country you can imagine and in up to 320 kBit/s. + Unique Radio Recorder Oceans XStream 2019 monitors tens of thousands of radio stations 24/7 and will always find the best radio station to record your musical wishes. + Automatic Perfection Avoids adverts and parts where the radio presenters are talking. Track recordings are accurate to the millisecond. Also saves ID3 tags, cover artwork and even lyrics. + Podcasts from All Around the World Browse through over 350,000 podcasts with millions of episodes that you can watch or listen to and subscribe to and save all your favourites. Every Format for Every Device Offering over 100 file formats and dozens of device profiles, Oceans XStream 2019 can convert any video or audio files in top quality. Play Everything Top entertainment with the Oceans XStream 2019 Player for movies, series, live television, podcasts, video clips, audiobooks and radio stations. DVD neXt COPY Oceans XStream.